Yellow zucchini ready for dehydrating. A summer challenge for most gardeners is what to do with all that zucchini when it “comes on”; it’s like watching a marathon where most of the runners finish together, rather than spaced out in an orderly fashion that one can deal with. Zucchinis, before and after dehydrating. I use an Excalibur dehydrator in my garage, but even though it has a capacious 9 shelves, I often need more, so I have two other older models (5 tray) as well. My Excalibur dehydrating machine set to go to work! I set the timer to 4 hours usually, but often check earlier than that. It’s tempting to stop the process when the vegetable is pliable and ‘chewy’ but I’ve learnt, from having to abandon some mouldy packets, that crisp is best, and safest. I usually fill ziplock bags with the dried product, press out extra air as I seal them, and keep them in a tote, in the dark. However, some of them I am so proud of, and so enjoy looking at the varied shapes and colours, that I keep them in jars on my kitchen bench. You really shouldn’t, since sunlight advances oxidation, but don’t they look great? I like having my dried veggies on hand in the kitchen; they're part of my Fast, Slow Food pantry. I immediately dropped all the plans I had for the day and set to collecting suitable containers to bring the milk home in. It is not often that I get such a wonderful opportunity, in fact this is the famous first! I am now busy processing 4 gallons of beautifully fresh milk into mozzarella cheese. I’ll take one batch back to the farmer in thanks, and keep the other three for myself. Will post the how to and photos soon, when my hands are not so full! Birch syrup rendering over an open fire. Well, it wasn’t exactly cost-effective, but we did taste the terroir of our own birch/maple syrup for the first time yesterday. Yes, that word ‘terroir’ extends beyond wine to other earthy products, because syrups do have local flavours, too. Most people think of maple sugar production as quintessentially Canadian, and located either in Quebec or Ontario. It’s just not an activity one associates with the prairies or here on the western Cordillera–but we did it! We found six birch and three maple trees in our front yard which looked likely producers, and tapped them last week. Over the weekend we continued to clear the front forty, and in the process of burning the small dry sticks and undergrowth, we rendered down our first batch of maple/birch syrup. The rendering ratios are 40 and 100 to one respectively, and because the maples produced more sap, the ratio of syrup was about 40:60, so by my calculations (and believe me, during the day we had time to calculate!) we ended up with a mix of about 20% maple, 80% birch. My friend Clarence came by and stood amazed at what we were doing, never having witnessed this activity in this valley. As I looked across at my little yellow buckets hanging from their spiles in the tree trunks, I wondered why we are not all harvesting from our woodlots in this serene, labour-free way. Much of our radio news these days is filled with so-called ‘catastrophists’ predicting global economic ruin, and advocating getting out of cities, and I’m glad we are in a place where there is still so much knowledge of how to fend for oneself (Clarence’s friend supplied me with the spiles, buckets and advice on which trees were best), and enough space to do so. Birch syrup rendering continues inside for the final stages. I had read that you can easily burn syrup in the last stages. Mind you, you can easily boil it all away thinking it’s still just water, because it looks that way for most of the process: no amber colour, no viscosity. We had been away for a few days and weren’t sure how much of the buckets was in fact rain water–but we remained hopeful. After a day’s boiling, I brought the pot inside to complete the task on the stove. Sure enough, miraculously, at about one inch depth the liquid suddenly thickened, darkened, and looked like maple syrup. I took my first, tentative, frugal sip. Delicious! I read that boiling over an open fire imparts a camp-fire, smokey taste, and that’s true; this seems to enhance the caramel flavour, while underneath (almost literally) is an earthy, mineral flavour. I contrasted this with the more ‘clear, crisp’ taste of some birch syrup we buy in Quesnel, a town northeast of us, up on the plateau. So, after a day and a half, I had about a quarter of a cup of pure gold in a jam jar, and we’d burnt all our windfall sticks and branches. We’d also shared two days outside under grey skies with temperatures heroically hovering just above freezing, but we were able to celebrate our ‘spring’ break pleasantly warmed by the fire and dreaming of future spring days, when the air will smell of turned earth and chlorophyll rather than smoke and birch sugar. My food sovereignty year started with gathering fiddlehead ferns in early April, but this new discovery has extended my growing season into March. My attitude towards time has shifted; as a self-provisioner, it is now geared to food availability rather than the clock and the calendar. I used to regard my year of activity as beginning on May 24, the traditional date for beginning safe frost-free outdoor gardening; with the discovery of fiddleheads it regressed, and now it has regressed even further. My world is measured by food: not only in time, but in space also, because wherever I walk or drive I remember what food I gathered there, or what i might gather in the future–that berry patch, that bend in the river. This must be how animals map their worlds, too. Last week while clearing the front of our property I realized from their trails that bears travel east/west and deer travel north/south, because their food sources lie in those directions (the bears follow along the streams to the salmon rivers via the berry bushes, the deer to the meadows via my vegetable garden). Like the Aborigines of Australia with their songlines, I am making my own tracks across this valley. Like the deer and bears, my map is taking shape along paths of sustenance. The results of the first rendering of my maple-birch syrup--tiny, but tasty and worth its weight in gold! And while my project of food sovereignty is not always about cost effectiveness, this exercise renewed my appreciation for how cheap our food is: Quebec maple syrup in a jug at our supermarket is about $12. The more self-sufficient I become, the more I learn about how much effort it takes to feed myself. As with other food items for sale in the store, I now think $12 for a jug of maple syrup is far too cheap for the resources used–even considering the so called efficiency of mass production. Several years ago, while still living in New Zealand, I wanted to learn more about bread. I went to the library and took out virtually every book they had on bread making and bread baking. There of course were several beautifully done books, and one that stands out in my mind to this day was called The Bread Builders. As I recall, it was exquisitely illustrated providing tantalizing glimpses of far away places, evoking succulent smells of baking breads and heady aromas of wood fired ovens. The book that taught me the basics of yeast wrangling! 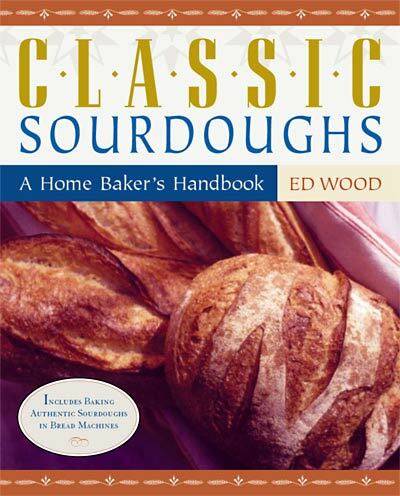 While that book got my mouth watering, my eyes dancing and my imagination traveling, the book that intrigued me the most was called Classic Sourdoughs: A home bakers handbook, by Ed Wood. In this book, he skillfully describes the art of developing a true sourdough culture, how to feed it, ways of preserving it, and how to use it artfully. There are also a host of wonderful recipes to work your way through on your journey of becoming a bread builder. Once you have caught your true sourdough, Wood explains, you need never go to the store to buy yeast again. Now that kind of knowledge is a cornerstone in the foundation of true independence–I had to try it. Of course, while reading the chapter on how to acquire the yeast spores, my imagination got away from me. Instead of the benign creatures Wood described, I pictured something different. After all, the yeast spores I was to catch were not at all like the garden variety you picked up at any grocery store. No, these spores were wild, untamed, unruly. The microscopic, but voracious, yeast spores my mind conjured up were riding tiny Mustang horses, sporting yellow sombreros a la Speedy Gonzalez, decked out in full gaucho gear, replete with chaps, hand-guns, and cross-their-hearts-ammo belts, galloped through the air, and indiscriminately shot their guns off. Obviously, this sort of yeast wrangling was going to be a challenge. What I had to do was figure out how to catch and tame them: lasso, tie down, corral, file steadily into a small bowl, and finally, break and train them to a level of finesse required to enter the culinary equivalent of Grand Prix Dressage. The process is, sadly, much more sedate. No horse needed. In fact, it is shockingly simple: mix water and flour together in bowl, cover with gauze to protect from flies, set near open window, keep warm, feed often. Voila, a couple of weeks into this mild mannered process, you will have yourself a viable sourdough culture. I tried it. Within days, I had a bubbling concoction that smelled exactly as you would expect a yeasty brew to smell: like yeast, with light undertones curiously reminiscent of a beer burp. The next step, of course, was to see if it actually raised bread. Wood warns the reader that it may take a few weeks, sometimes several months, of keeping the culture alive before it will make a good bread. In the meantime, he advises, use the part of the product that you pour off, when feeding the culture, to make pancakes and muffins. So I did. If you like sourdough pancakes, but have never caught a true sourdough culture, then you have never truly had sourdough pancakes–and thus you are missing out. The pancakes made from this culture were fantastic, possibly the tastiest I’d ever made. It wasn’t long before I was brave enough to try making my first loaf of bread with my own sourdough culture. I started with a focaccia so that, I reasoned, in case it didn’t really rise well no one might notice! I needn’t have worried; it worked beautifully. The focaccia was gorgeous, the air pockets well formed and uneven, just like the better bread from bakeries. I was immediately hooked and never looked back. Today, I scoff at the ‘regular’, store-bought yeast for bread making. Instead, I make everything with my own: a wide variety of breads both sweet and savoury, muffins, pancakes, even chocolate cakes! This process is the only way to obtain a true sourdough culture, pure and simple. Unlike the more popular version of so called sourdough of present day, the kind that begins with store-bought yeast and adding sugar and vinegar or some such other phony brew, the true sourdough culture dates back through antiquity to ancient Egypt. The ancient Egyptians were the first peoples to discover this technology, of how to leaven bread. Having studied this, and being a passionate collector of sourdoughs from around the world, Ed Wood founded Sourdoughs International, a company that collect, maintains and sells sourdough cultures from around the world. He also wrote the above mentioned book, in which he chronicles many of his worldly travels, all in the name of true sourdough collecting. In 1993, Wood collaborated with Egyptologist, Dr. Mark Lehner, to determine how man made his first leavened bread in Egypt, a project supported by the National Geographic Society (National Geographic Magazine, January 1995). After about a year of continual use of my own culture, I decided to contact Ed Wood from my home in Rotorua, New Zealand, and let him know how much I appreciated his book and how wonderful my culture was. He was intrigued enough to ask me to send him a sample, which he subsequently put through his testing kitchen. He was very happy with the results and said he was surprised at how well it performed; so he offered to buy it from me in exchange for the ability to sell it. ‘You’re not going to get rich off this,’ he laughed, and offered me a some-time-in-the-future commission ‘once some sales have been made’. Several years later, I returned to Canada and was really glad to have made that ‘deposit’ with Ed at Sourdough International, because not only could I not bring my yeast back home to Canada, but also the yeast that I caught in Bella Coola was lazy. My New Zealand yeast was caught in the volcanic centre of the North Island, which was possibly a factor in its vigour–like Old Faithful, you could count on it to rise! However, with this Northern hemisphere variety I could not raise a decent loaf of bread to save my life. After about a year of unsuccessful Bella Coola yeast wrangling and frustrated bread making, I gave in and contacted Ed Wood again. He kindly sent me a package of my own yeast starter. It was amazing to have this resource–like having my own ‘ark’ or vault from which I could access my own heritage food! One of seven spaghetti sauces made yesterday. Directions: remove skins on tomatoes. To do this, blanch in boiling water for 60 seconds and then place in cold water, slip off skins. Remove any blemished parts. Cut into quarters and place in large uncovered pot. Boil at least 20 minutes, if not longer (I usually boil for 30-45 mins). Press through a sieve or food mill. In a heavy sauce pan, saute onions, garlic, and peppers in olive oil until tender. Add sauced tomatoes and remaining spices and sugar and bring to a boil. Simmer uncovered until thick enough for serving. This may take a couple of hours, volume should reduce by nearly on-half. Stir often to prevent sticking/burning. 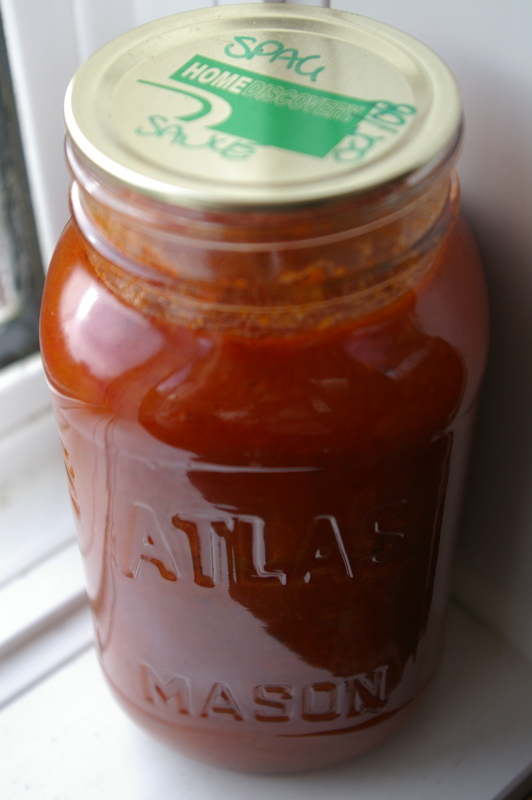 Pack hot jars with hot sauce, leaving 1-inch head space. Remove air bubbles. Wipe rims and adjust lids and screw bands in place. Weighted guage type @ 10 pounds pressure. 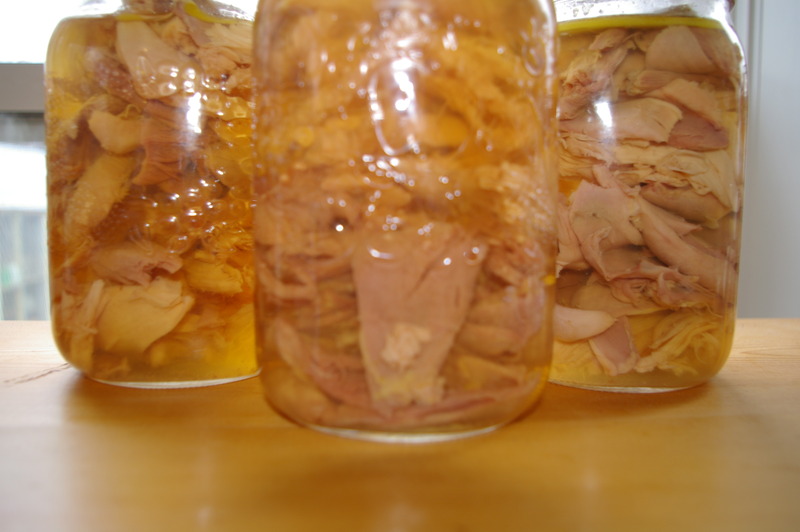 After processing, remove jars and place on a rack to cool. Test for seal. NOTE: Do not increase the amounts of vegetables.